The NY Times has been accused of anti-Catholic bias, but David Gonzalez' piece, Learning to Worship Together in a Combined Parish, which appeared last week, showcases the best of both the Times and the Catholic faith. This is a thoughtful portrait of a parish priest and his scattered flock as they adapt to seismic changes in the Catholic world. While Father Fenlon and his parishioners are wonderful, the good news is that there are many like them quietly serving, praying and coping all over the world. 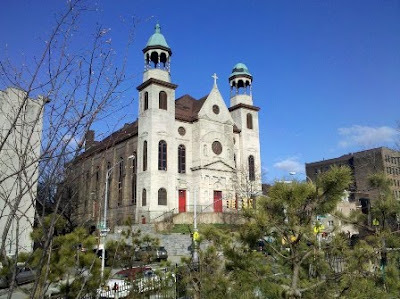 The picture of St. Augustine Church, above was taken by Matt Green, who is on a mission to walk every street in New York City. Thanks to Matt for documenting the people and places that are the heart and soul of our city. His travels can be followed on his blog, "I'm Just Walkin'"